Electronic Materials Research Institute, Northeastern University, Boston MA USA. For the past decade engineered nanoplatforms have seen a momentous progress in developing a multimodal theranostic formulation which can be simultaneously used for imaging and therapy. In this report we describe the synthesis and application of theranostic phospholipid based polymeric micelles for optical fluorescence imaging and controlled drug delivery. CdSe quantum dots (QDs) and anti-cancer drug, doxorubicin (Dox), were co-encapsulated into the hydrophobic core of the micelles. The micelles are characterized using optical spectroscopy for characteristic absorbance and fluorescence features of QDs and Dox. TEM and DLS studies yielded a size of <50 nm for the micellar formulations with very narrow size distribution. A sustained release of the drug was observed from the co-encapsulated micellar formulation. 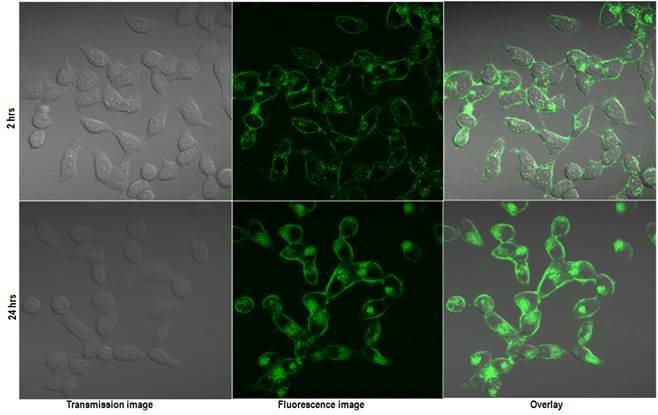 In vitro optical fluorescence imaging and cytotoxicity studies with HeLa cell line demonstrated the potential of these micellar systems as efficient optical imaging and therapeutic probes. Here we report an efficient theranostic phospholipid based micellar system encapsulating anti-cancer drug doxorubicin (Dox: for therapy) and CdSe quantum dots (QDs: diagnosis). Fluorescent QDs have been investigated extensively as luminescent biological probe because of their nanometer dimensions and attractive optical properties including high-absorption cross section, narrow and symmetric emission band and high resistance to photobleaching. The hydrophobic QDs can be easily encapsulated in the core of the micelles because of the ultra-small dimension. The anti-cancer drug Dox has been studied extensively in a variety of cancer models. [20, 21] The cytotoxic mechanism of the Dox involves DNA intercalation as well as by lipid peroxidation and inhibition of the topoisomerase II. [22, 23] In our micellar formulation we have combined QDs and Dox for building a robust theranostic platform. In earlier reports, similar approaches by conjugating the QDs and drugs were used. [24, 25] In this manuscript, we have exploited the hydrophobic core of the DSPE-PEG based micelles for encapsulation of Dox and QDs together. The release kinetics was carried out to confirm the sustained release of the Dox from the micelles. The therapeutic efficacy of the micellar formulation was tested in vitro using HeLa cell line. In vitro imaging studies were also performed for the cellular uptake behavior of the micelles. The multimodality of the micellar formulation with the presence of PEG for passive accumulation, high colloidal stability and therapeutic efficacy makes these polymeric micelles potential candidate for diagnosis and therapy of cancer. Lipids, 1,2-distearoyl-sn-glycero-3-phosphoe­thanolamine-N-[methoxy(polyethylene glycol)-2000] (DSPE-mPEG-2000), 1,2-distearoylglycero-3-phospho­choline (DSPC), in powdered form were procured from Avanti Polar Lipids (Alabaster, AL). Doxorubicin hydrochloride (Dox.HCl), chloroform and other solvents were purchased from Sigma and were used without further purification. CdSe QDs (Lumidot 480 nm, hexadecylamine stabilized dispersed in toluene with a of size 2.1 nm at a concentration of 5 mg/ml) were purchased from Sigma. HPLC grade water was used in the formulations. HeLa cell line was procured from ATCC (Rockville, MD) and cultured according to instructions supplied by the vendor. MTS reagent CellTiter 96® AQueous One Solution was procured from Promega (USA). Biological growth medium, DMEM, and serum were purchased from Invitrogen. Microfuge membrane-filters (NANOSEP 100K OMEGA) are a product of Pall Corporation. The hydrophilic form of the drug Doxorubicin HCl was converted to its hydrophobic form by neutralizing the hydrochloride salt with the base triethylamine. Briefly, to 10 mg of powdered Dox.HCl, 0.54 mmol of triethylamine was added and incubated overnight. The non-aqueous from of the Dox was extracted using methylene chloride and evaporated. The powdered Dox was dissolved in chloroform at a conc. of 2 mg/ml and stored at 4o C until further use. Polymeric micelles encapsulating Dox was prepared using our previously reported method with slight modifications. Briefly, a total of 5.5 x 10-6 mol of phospholipid mixture dispersed in 1 ml of chloroform was used for making the polymeric micelles. The composition of the different lipids in the mixture contained 40% DSPE-PEG and 60% DSPC. For preparing the micelles, 50 µl of Dox (2mg/ml in chloroform) and 200 µl of CdSe (5 mg/ml in toluene) were taken in a round bottom flask followed by the addition of 1 ml of prepared phospholipid solution as described above. The solution was sonicated for 15 sec followed by evaporation of the chloroform using a rotatory evaporator. The obtained thin film was heated over a water bath for 2 min at 70oC and finally rehydrated with 2ml HPLC grade water. The solution was further sonicated for 10 min to obtain an optically transparent solution that contains Dox and QDs encapsulated polymeric micelles. The non encapsulated QDs were removed by centrifuging the samples at 2000 rpm for 10 min. Since the non encapsulated QDs were not stable in aqueous environment, they tend to aggregate and can be easily separated at low centrifuge speed. The non-encapsulated Dox was removed from the micellar suspension by using 100kDa centrifuge spin filters. The pellet was further dispersed in 2 ml of water and stored at 4°C for further use. The optical studies for Dox, QDs and in their encapsulated forms were done by absorbance and fluorescence measurements. The absorption spectra were collected using a Agilent 8453 UV-Vis spectrophotometer over a wavelength range from 300 to 800 nm. All samples were used as prepared and loaded into a quartz cell for measurements in the appropriate solvent and measured against water or chloroform as the reference. The emission spectra were collected using a Fluoromax 4 Spectrofluorometer (Jobin Yvon; fluorescence spectra) using an excitation wavelength of 405 nm (QDs) and 488 nm (Dox). Transmission Electron Microscopy (TEM) images were obtained using a JEOL model JEM- 100CX microscope at an acceleration voltage of 80 kV. The specimens were prepared by drop-coating the sample dispersion onto an amorphous carbon coated 300 mesh copper grid followed by addition of another drop of 1% phosphotungstic acid (for negative staining) which was neutralized with dilute NaOH solution to maintain the pH 7. The grid was placed on a filter paper to absorb excess solvent. Dynamic Light Scattering measurements were done by using 90Plus zeta sizer (Brookhaven Inc, NY) for measuring the hydrodynamic diameter of the different polymeric micelles formulations by taking a diluted sample in 3 ml cuvette. Zeta potential measurements were also done using the same instrument. The release kinetic studies were carried out by incubating the QD-Dox formulation at 37oC with 1% tween 80 solution in water. 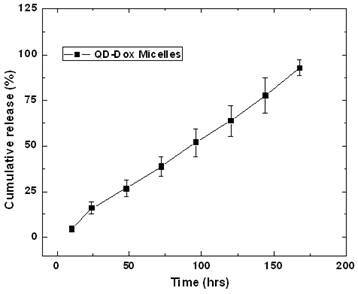 The concentration of Dox in the QD-Dox micelles was 46 µg/ml of micellar solution. The samples were spin filtered after a specified period of time using microfuge membrane-filter (NANOSEP 100K OMEGA, Pall Corporation, USA) at 14,000 rpm for 30 min (spin-filtration). The Tween-80 micelles along with any released Dox flowed through this membrane and fluorescence was measured for each filtrate collected. For estimating the released drug from the micelles, a standard curve was made by measuring the fluorescence with different concentration of the Dox and then reading out the released dox concentration from the standard curve and finally plotting the cumulative release against the time. The percentage of the released drug was calculated by taking into account the total drug encapsulated in the micelles and amount released at each time points. For in vitro imaging with different polymeric micelles formulations, human cervical cancer cell line HeLa was cultured in Dulbecco minimum essential media (DMEM) with 10% fetal bovine serum (FBS), 1% penicillin, and 1% amphotericin B. The day before micelles treatment, cells were seeded in 35 mm culture dishes. On the treatment day, the cells, at a confluency of 70-80 % in serum-supplemented media, were treated with the polymeric micelles at a specific concentration (100 µl/1ml media) for two hours at 37oC. The cells were washed twice with DMEM before imaging to remove any free micelles present in the culture plates. The cells were imaged using a confocal microscope after 2 and 24 hr incubation time period with the micelles. Confocal Microscopy images were obtained using a Zeiss LSM 700 confocal microscope (Carl Zeiss, Europe) with excitation source at 405 nm and 488 nm for QDs and Dox respectively. For the QDs and Dox formulations two separate emission channels were used for sequential emission acquisition of two different fluorophores. All images were taken under exact same conditions of laser power, aperture, gain, offset, scanning speed, and scanning area. HeLa cells were dispensed into a 96-well flat-bottom microtiter plate (Nunc) (5000 cells/well) using DMEM medium with 10% FBS and allowed to attach overnight. Cell viability was assessed by the CellTiter 96® AQueous One Solution Cell Proliferation Assay. This assay is a colorimetric method to determine the number of viable cells in proliferation or cytotoxicity assays and is based on the bioreduction of MTS tetrazolium compound (Owen's reagent) by the cells into a colored formazan product that is soluble in tissue culture medium. This conversion is presumably accomplished by NADPH or NADH produced by dehydrogenase enzymes in metabolically active cells In brief, after 4 h treatment with different micellar formulations and free Dox, media was changed, and the AQueous One Solution was added to the cells. Each was mixed for 2 min and allowed to incubate for 4 hrs inside incubator. Absorbance was measured at 490 nm using a microplate reader (Bio-Tek Synergy HT microplate reader) and data were expressed as a percentage of the control. Tests were performed in quadruplicate. Each point represents the mean ±SD (bars) of replicates from one representative experiment. The micellar formulation encapsulating hydrophobic QDs and Dox were prepared by lipid hydration method. The hydrophobic core resulting from the bulky acyl chains of the phospholipid provides space for the hydrophobic compounds as illustrated in Figure S1/Scheme 1. This hydrophobic core is further stabilized in the aqueous environment by PEG chains. This amphiphilic nature of the phospholipids results in a stabilization of the hydrophobic compounds in the aqueous environment making delivery of many of these hydrophobic drugs possible. [27, 28] Highly fluorescent QDs are generally synthesized with hydrophobic ligands and for biological applications have to be converted to hydrophilic particles. Therefore, the process of micellar encapsulation of QDs provides a simple and robust platform in which the hydrophobic compounds can be co-delivered avoiding the complicated methods for ligand displacement and further functionalization to render hydrophobic particles biocompatible and stable in in vitro and in vivo systems. Figure 1 shows the size distribution profile of various micellar formulations. As it can be seen from the figure, both the micellar formulations, QDs micelles and QD-Dox Micelles showed a hydrodynamic diameter of approx 35 nm and 50 nm respectively, which is typical for the micellar system composed of mixture of lipids. The slight increase in the size of the QD-Dox micelles can be attributed to the additional swelling of the micelles because of the addition of Dox. Representative TEM image of these micelles co-encapsulating QD-Dox showed almost spherical morphology with a uniform size distribution of 50 nm. The cluster of QDs in discrete pockets shows the encapsulation of the QDs in the micelles core (figure 1: right panel A). TEM image of QDs dispersed in toluene (figure 1: right panel B) showed a narrow distribution of the individual QDs with a size ~2.2 nm. It is worth noting that in case of QD-Dox micelles, multiple QDs are localized in the hydrophobic core of the micelles as can be visualized from the figure. Depending upon the ratio of phospholipids to the hydrophobic compounds, the core of the micelles can be tuned to accommodate multiple to single hydrophobic molecules/nanoparticles. (Scheme 1) Schematic representation of the synthetic strategy of the phospholipid based micelles encapsulating CdSe QDs and doxorubicin. Size distribution and morphology studies of the micellar formulations by Dynamic light scattering measurements (left panel) and Transmission electron Microscopy (right panel). TEM image of (A) QD-Dox micelles, (B) QDs dispersed in toluene and (C) blank micelles. Inset shows the magnified image of the QD-Dox micelles. In earlier studies by Dubertret et al have shown the encapsulation of single QD in the core of the phospholipid micelles whereas Park et al have shown the number of iron oxide encapsulated in the core of the micelles can be increased by changing the ratio of nanoparticles and phosphoilipids. [29, 30] We have also studied the surface charge of these micelles by measuring their zeta-potential values. Both the micellar formulations showed a net negative charge of -31mV which can be to the presence of PEG and partial negative charge from the lipid DSPC on the surface of the micelles. Figure 2 and 3 shows the optical characterization of the micellar formulations. 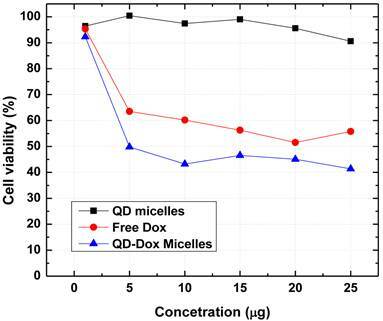 As prepared samples with a concentration of 46 µg Dox and 500 µg of QDs in QD-Dox micelles and 500 µg of QDs in QD micelles dispersed in 2ml of water were used for measurements. Figure 2 shows the absorption spectra of the QDs and Dox in free as well as encapsulated form. The QDs spectra demonstrate an absorption feature at ~460nm. The absorption peak for the QD-Dox sample was merged with the QDs absorption peak and appears as a small hump in the 500-600 nm range. The absorption spectral feature of Dox in micellar formulation is very small due to the low concentration of the Dox and sensitivity of the instrument. Free Dox in chloroform showed a typical Dox optical feature with λmax centered around 490 nm. The photoluminescence studies with the free QDs showed an emission band at ~478 nm whereas in the micellar form the emission band is slightly blue shifted to 470 nm (Figure 3). 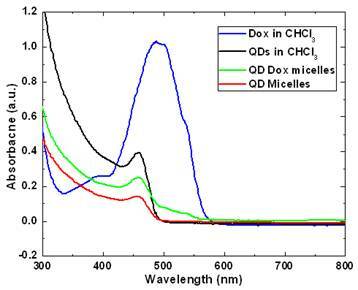 QDs-Dox micellar formulation showed an intense Dox fluorescence with typical emission band at 590 nm. The Dox spectrum retains the typical molecular Dox fluorescence characteristic feature. The QDs peak for the QD-Dox micelles has been enlarged to show the QDs emission from the co-encapsulated micellar system. UV-Visible absorbance spectra of CdSe QDs and doxorubicin in free form in chloroform as well as in encapsulated form in micelles. Photoluminescence spectra of the CdSe QDs and doxorubicin in free form in chloroform as well as in encapsulated form in micelles. The spectrum of QDs in QD-Dox micelles is enlarged on the left for clarity. (See supporting info for non-normalized data). The photoluminescence spectrum of free QDs in Figure 3 shows two distinct fluorescence peaks. The first peak at ~ 470 nm corresponds to excitonic band emission and is slightly red-shifted compared to the absorption peak at ~ 460 nm. The second broad peak centered at around 600 nm is attributed to deep trap emission and is typically seen at longer wavelengths compared to the narrow and intense excitonic emission peak. The deep trap emission arises due to the presence of deep trap sites on the surface of quantum dots that is associated with chalcogen vacancies. It is an inherent property in a QD that is incorporated during the synthesis. This phenomenon is most prominent in small sized quantum dots that have greater probability of chalcogen vacancies due to the large surface to volume ratio. [32-34] The QDs used in this experiment were ~ 2.1 nm and hence have the broad deep trap emission peak. Upon encapsulation within micelles, there is some degree of aggregation resulting in the deep trap emission peak to shift from 600 nm to ~ 640 nm. The release of the encapsulated drug from the micelles was studied by fluorescence spectroscopic measurements. Figure 4 presents the release kinetic profile of the encapsulated Dox from the QD-Dox micelles. The results showed a sustained release of the Dox from the micelles over a period of 7 days. Almost 95% of the cumulative drug release was observed from the micelles within 7 days. The release of the drug from the micelles can be modulated, if needed, by adding cholesterol to the micellar formulation which imparts rigidity and reduces the fluidity of micellar structure and thus slowing down the release of the encapsulated drug. However, in this system, 95% drug release over 7 days is beneficial as both the drug and QDs can be cleared out of the body faster upon drug release and destabilization of the micelles. For carrying out the release kinetic studies, it is worth noting that the use of serum as external media would have been the best, however using the dialysis method; the cellulose dialysis membrane is completely incompatible with the serum. Thus we have used 1% Tween 80 which mimics the in vivo serum conditions by forming hydrophobic pockets which can stabilize the released drug from the micelles and thus avoids aggregation of the hydrophobic drug in the aqueous environment. Release kinetics study for estimating the release of the doxorubicin from the QD-Dox micelles. To verify the imaging capabilities of the encapsulated QDs, we have carried out in vitro cellular uptake studies using human cervical cancer cell line (HeLa) and studying the uptake by confocal microscopy. Figure 5 shows the in vitro confocal images of the HeLa cells incubated with QD micelles for two different time points of 2 hrs and 24 hrs. From the figure a time dependent increased uptake of the QDs is quite evident. A robust uptake of the QDs can be visualized clearly over a period of 24 hrs. The accumulation of QDs has been seen mostly centered around the endoplasmic region of the cells, which is consistent with pattern of nanoparticles uptake as shown earlier. 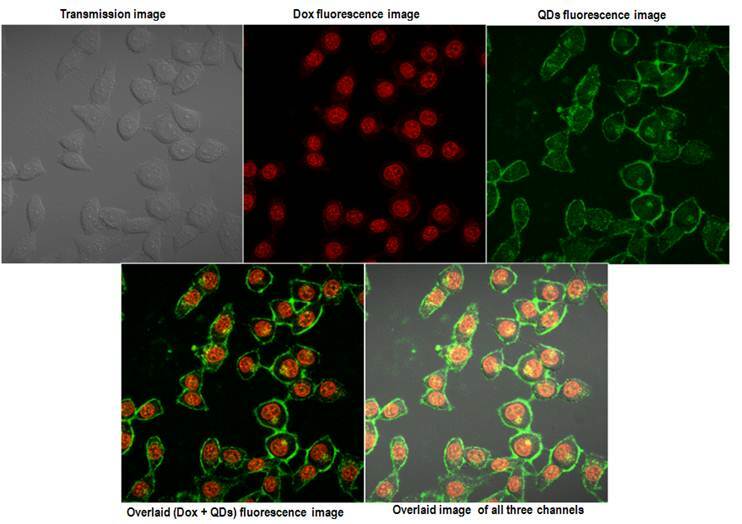 Figure 6 shows the confocal fluorescence images of the HeLa cells treated with QD-Dox micelles. Dox has been known to penetrate the cell nucleus where it intercalated with cellular DNA to show cytotoxicity. Within 2 hrs a strong accumulation of Dox was observed from the nucleus of HeLa cells. The QDs fluorescence signal remained similar to what was observed with the QD micelles after 2hrs incubation time. The overlaid images clearly showed the expected distribution of the QD-Dox micelles with Dox accumulating in the nucleus and QDs in cytoplasm as well as plasma membrane. Incubation of QD-Dox micelles for 24 hrs resulted in a higher cytotoxicity as a result the cells were not imaged after 24 hrs incubation. The use of cadmium based QDs usually raises the concern for potential cytotoxicity. We have further carried out in vitro cytotoxicity assays to confirm the biocompatibility of the QDs micelles as well as for estimating the therapeutic efficacy of the encapsulated Dox. Figure 7 shows the results obtained from the cell viability assay (MTS assay) carried out with HeLa cell line incubated with QD micelles, free Dox and QD-Dox micelles. The concentration of all the samples was calculated based on the concentration of Dox present in the micelles. The results clearly demonstrated the potential of these theranostic micelles. QD micelles showed >95% cell survival after 24 hrs incubation time period demonstrating biocompatibility of the QD micelles. QD-Dox micelles at a Dox concentration of 5 µg/ml showed a strong cytotoxic effect (~50% cell survival) whereas at the same concentration, free Dox showed more than 65% cell survival. This result clearly depicts the efficient delivery of the Dox to the HeLa cells. The sustained release of the drug resulted in a constant pool of drug which is available for the cells for longer time period as opposed to free drug. Based on the above results we believe that these stable and robust theranostic micellar formulation co-encapsulating QDs and Dox can be used as an efficient nanoplatform for imaging and therapy of cancer in vitro and in vivo. However, further in vivo studies are required to confirm this. Confocal images of the HeLa cells incubated with QD micelles for 2 hrs (upper panel) and 24 hrs (lower panel). Same instrument settings were used to acquire all the images. Confocal images of the HeLa cells incubated with QD-Dox micelles for 2 hrs. The upper panel shows the images acquired from the three different channels and the lower panel shows the overlaid images. Cytotoxicity assay (MTS assay) carried out with different micellar formulations of QD micelles, QD-Dox micelles and free Dox in HeLa cell line. All the formulations were incubated for 24 hrs. In summary, we have synthesized phospholipid based micellar system encapsulating QDs and doxorubicin using a simple lipid hydration method. The encapsulated drug showed a sustained release from the micellar core over a period of 7 days. A strong time dependent uptake of the micelles have been demonstrated successfully using confocal microscopy. The biocompatibility of the micellar system was confirmed by cell viability assay which showed a strong potential of these theranostic micelles for imaging and therapy of different diseased conditions including cancer management.